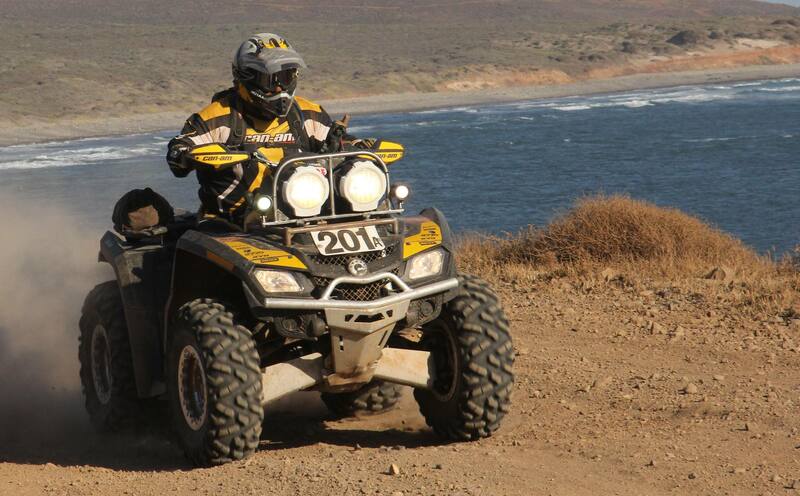 PORTLAND, Ore. – Once again, PIAA lamps lit the way to victory at a demanding ATV endurance race – this time the prestigious 43rd running of the Tecate SCORE Baja 500 held in early June. Mike Penland Racing, with Penland and Carl Vela at the controls, won SCORE Class 26 for utility ATVs, completing the course in 15 hours and 31 minutes. Mike Penland Racing is based in Rabun Gap, Ga.; co-driver Vella is from Ardsley, N.Y. Their Can-Am Outlander 800 utility ATV was equipped with two 6-inch PIAA HID Shock Lamps and two smaller HID Cross Country lamps. Together, the PIAA HID foursome tuned night into day over the final hours of the race. The efficiency of the PIAA HID bulbs was proven by the Can-Am ATV, which required no electrical system modifications to accommodate the lamps: the stock Can-Am alternator worked perfectly, Penland said. PIAA HID Shock Lamps feature an internal ballast, impact-resistant housing, and multi-surface reflector, a brilliant solution for long-range driving and off-road visibility. The 6-inch version (RS600) used by Penland utilizes a hard clear-coated, unbreakable polycarbonate lens, while the long-range HID fire-power comes from a PIAA 12-volt H3 35W HID bulb. The PIAA Cross Country HID is an ultra-compact lamp, featuring an internal ballast, multi-surface reflector, 30-watt HID bulb, and low-wattage draw. For details on all PIAA UTV and ATV lighting products, visit www.piaapowersports.com. PIAA has been the acknowledged leader in innovative automotive and Powersports products since its founding in 1963. PIAA products, created in PIAA’s Technical Design Center in Japan, are known for their visionary design, inspired engineering and quality components. PIAA Corporation, USA is located at 3004 NE 181st in Portland, OR 97230, 503-489-6666.